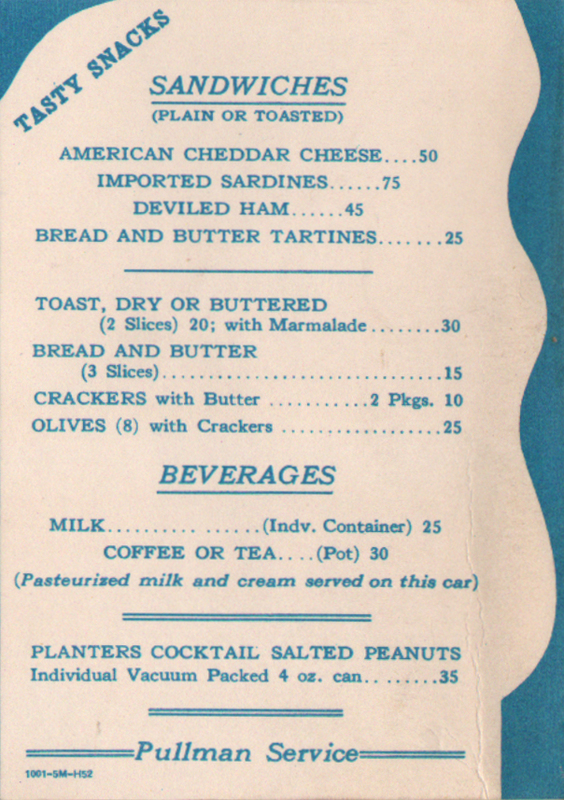 Description 1952 Pullman Rider attached to a Three (3) Musketeers cover Pullman Beverage Menu B-1-O-112C-L52 from B&O Train #20 on 12-15-52 - Advertising: Tasty Snacks - Sandwiches (Plain or Toasted), American Cheddar Cheese 50c, Imported Sardines 75c, Deviled Ham 45c, Bread and Butter Tartines 25c. Toast, Dry or Buttered (2 slices) 20c, with Marmalade 30c. Bread and Butter (3 slices) 30c. Crackers with Butter (2 Pkgs.) 10c. Olives (8) with Crackers 25c. Beverages. Milk (Indv. Container) 25c, Coffee or Tea (Pot) 30c (Pasteurized milk and cream served on this car) Planters Cocktail Salted Peanuts, Individual Vacuum Packed 4 oz. can 35c. Pullman Service, 1001-5M-H52. This riders uses the blue wavy boarder design.